Posted 04/14/2015 by Daniella Torres & filed under Economic Justice. Research has proven that women are paid less than their male counterparts performing identical jobs under identical conditions. Women continue to be undervalued and underpaid employees in nearly every occupation. In addition to raising awareness for the need of fair pay, Equal Pay Day highlights the complexities of intersectionality in employment and wage. Currently, it will take 104 days into 2015 in order for the average woman to earn what her male counterpart earned last year. That is an additional four months. 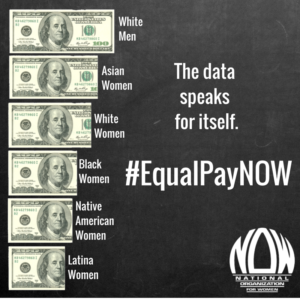 Factoring in race, it would take a Latina woman approximately six months in order to acquire one-hundred percent of her earned wage. Currently Latinas are at the bottom of wage gap making only sixty-seven percent of what a white man would. Other factors that may complicate this statistic are sexuality, age, marital status, and physical ability. I currently attend a four-year private institution, and it has its perks. I am privileged to be receiving a world-class education with global, leadership, and networking opportunities. When I accepted the admissions offer I thought the pros would outweigh the cons. Now knowing that after I graduate college I will only receive eighty-two percent of what my male classmate/counterpart would earn, I can’t help but wonder – is this investment worth it? Regardless of the fact we may be in the same program, attain the same grade point average, and graduate from the same university, he will make more money than me. And that makes me angry. Being raised in the South Bronx, New York, I have had my share of poverty. My community is mostly composed of unemployed men of color and single-mothers of color, struggle to survive on little to no pay. For the women in my community, working multiple poverty-wage jobs (fast-food and restaurant industry, retail, household maintenance, etc.) is the only way to feed their children. Most often than not, these poverty-wage positions only provide women with part-time work because of the “threat” of motherhood. This threat is perpetuated by the reality that most times women of color do not have access to birth control or abortion services. Economic and racial privileges are easily seen within the context of the “motherhood threat”, because generally speaking, white women have greater access to reproductive healthcare than women of color. In the age of the Affordable Care Act, the threat of being mandated to provide health insurance is another key factor driving women of color into part-time, low-wage employment. Providing women of color with no option other than part-time, poverty-wage jobs to economically and socially establish themselves and their families is inhumane. The lack of opportunities for social and economic mobility goes against the notion that the United States is in a post-feminist and post-racial era. The reality is this: because I am a woman, I am valued less and my work is valued less. Because I am a Latina woman, I carry a number of racial stereotypes that further weaken my credibility and overshadow any and every job application I submit. However crippling racism may be I have not let it define who I am or what I stand for. 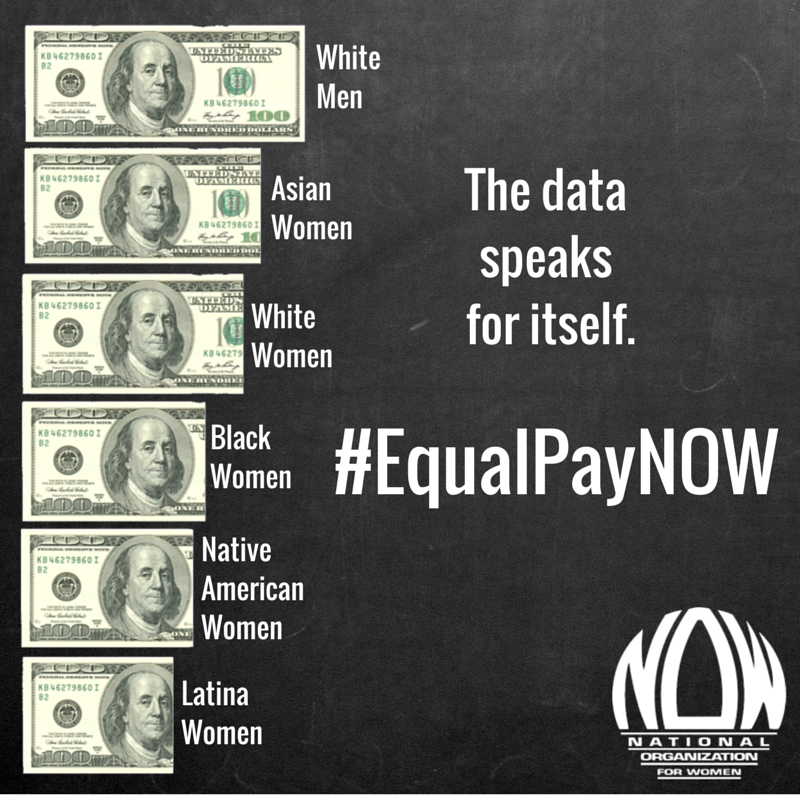 Equal Pay Day is another reminder of the challenges we all face as a nation. In addition to the hardships in looking for full-time employment after graduation, I will have to defy all the stereotypes associated with my ethnicity and Dominican heritage, and my gender. Because of these realities I will be paid less, and I will be valued less. Equal Pay Day challenges those realities. As feminists strive for equality in every aspect of life, it is important to highlight that equality is a human right. Although President Kennedy’s Equal Pay Act was signed into legislation in 1963, we have not yet achieved economic justice. Since 1963, the gap has been closing at a rate of less than two cents per year. Closing the gap has stalled and progress will continue to stagnant unless we pressure our local, state, and federal officials to pass legislation granting equitable pay. Women work hard for their salaries, and it’s only right they receive a fair wage. Women deserve economic justice. Women deserve equal pay. I agree…There aint no excuse for treatin women as if they matter less. Women are sacred as is their autonomy and personal rights.